October should be dry, hot and humid in the southern parts of the country but the year 2004 again proved that it is not necessary, some Octobers are the exception. But in 2004, the dry, hot and humid days turn into wet, cool and stuffy. These conditions emerged due to a cyclone that was powerful in strength, it came too close to the country’s coastal localities to cause severe destruction – It was Cyclone “Onil”. Onil is a Bengali name which is usually given to boys in Bangladesh and Indian Bengal. Cyclone “Onil” was the first cyclone ever to be given a name by the Indian Meteorological Department (head of South Asia). Before ‘Onil’ there were one cyclones each in the Arabian sea and the Bay of Bengal but they were not named. The World Meteorological Organization (WMO) said that it would be better for the Indian sub-continent and surrounding countries to name cyclones as that would keep a better track of the storm and the storm would get much-needed attention in the International press. WMO was worried about the insensitivity of the people of South Asia as naming cyclones could have hurt the sentiments of some people therefore unusual words were selected for the cyclone. On September 29, 2004, a low pressure formed in the Arabian sea near Mumbai that was upgraded to a deep depression ‘ARB 02’ on September 30. The next day the storm intensified into a cyclonic storm and hence earned the name ‘Onil’. The cyclone had an unusual track though it started a normal track towards Sindh-Gujarat coast, on October 3 ‘Onil’ reached near the coast of India and Pakistan at peak strength of 65 miles per hour winds and 990 mbar pressure, it also developed an eye in the center but after October 3, the storm started moving back into the sea and started weakening and made it’s first landfall over the coast of Gujarat as a remnant low pressure. Cyclone Onil did not make any landfall over the Pakistani coastline as the eye was far away from the land though Pakistan was most affected by the cyclone. Cyclone Onil did brought some heavy downpour to Sindh-Gujarat coast. When the storm was near Pakistani coastline, it was at peak strength thus it dropped significant rainfall in Sindh on October 2 and October 3; . Thatta got 145 mm rainfall. Mirpur Khas got 126 mm rainfall. Mithi got 105 mm rainfall. Hyderabad got 99 mm rainfall. Keti Bandar got 90 mm rainfall. Samaro got 78 mm rainfall. Badin got 76 mm rainfall. Matli got 67 mm rainfall. Chhor got 67 mm rainfall. Petaro got 66 mm rainfall. Tando Allahyar got 59 mm rainfall. Tando Mohammad Khan got 56 mm rainfall. Diplo got 56 mm rainfall. Tando Bagho got 55 mm rainfall. Digri got 54 mm rainfall. Umarkot got 39 mm rainfall. Karachi got 35 mm rainfall. Mithi got 23 mm rainfall. Shah Bandar got 10 mm rainfall. Pano Aqil got 10 mm rainfall. Sukkur got 8 mm rainfall. Nawabshah got 8 mm rainfall. Sanghar got 6 mm rainfall. Ghotki got 5 mm rainfall. 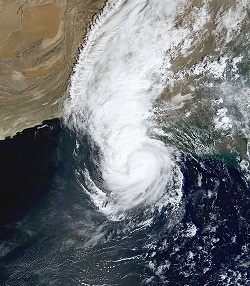 On October 2, cyclone Onil kept moving towards the Pakistani coastline in north-north-eastern direction as the storm was 425 kilometres south of Karachi and had the maximum wind speed of 100 km/hour while the storm surge was expected to be 10-foot high however the storm changed its track on October 3 and started weakening. On October 10, remnants of Onil dropped heavy rainfall over Gujarat coast that reached 100 mm. 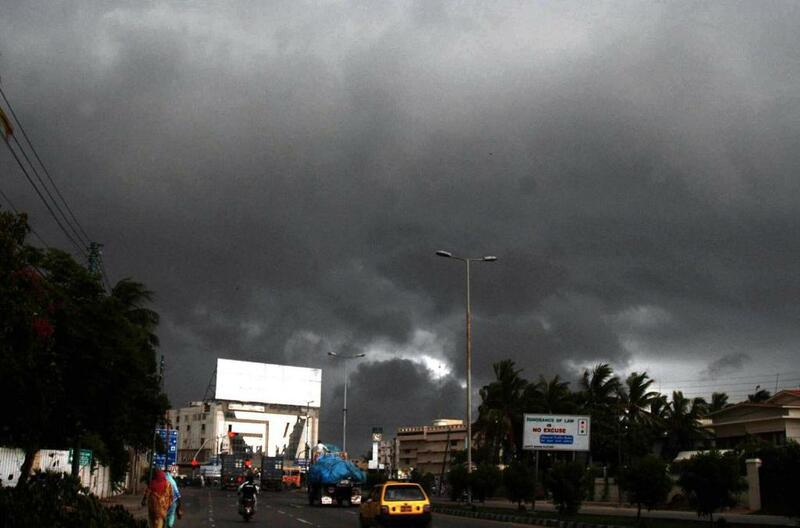 Cyclone backstabs drought in Karachi! 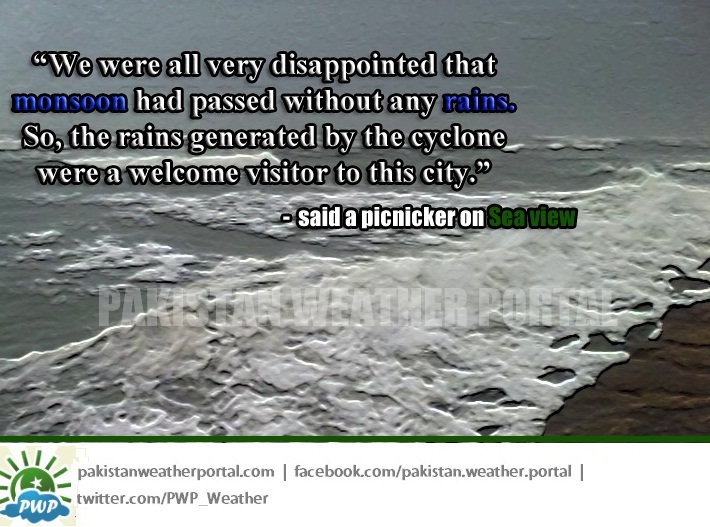 Karachiites were happy to see that cyclone would not come to their city. The storm brought cool winds and rain to the city that had been under drought since the start of 2004 monsoon season. Onil was the only source of rain in that year in the metropolis. Onil was about to repeat in 2009? 2009 came close in witnessing another ‘Onil’ almost at the same time. The GFS numerical chart showed that during the first week of October 2009, a low pressure could form near western coast of India that would move towards coastal Gujarat and intensify into a powerful cyclone and would bring widespread rainfall across the western coast of India and during the middle of October, 2009 the remnants of the storm would bring heavy rainfall across coastal Sindh including Karachi. Although this thing never happened, a weak low pressure did form near western coast of India that brought heavy rain only to India as the weather system dissipated rather quickly!